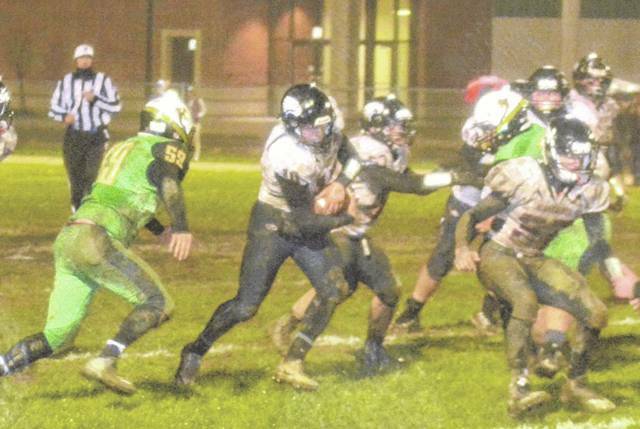 Mississinawa Valley’s Will Hall (37) runs around the right end for a gain against Bethel on Friday night. The Bees shut out the Blackhawks 30-0. 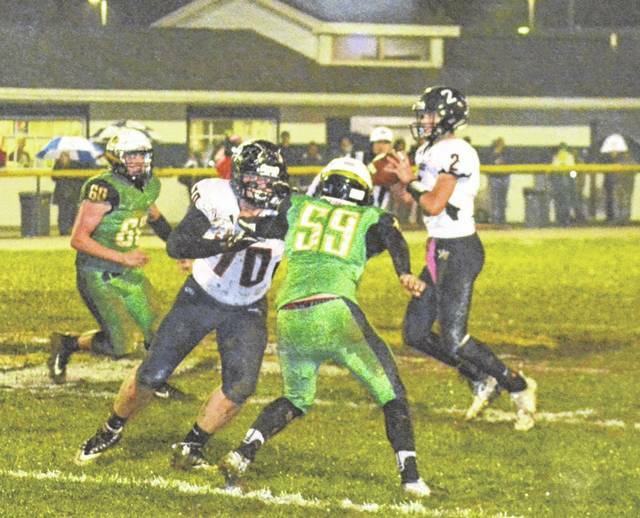 Mississinawa Valley’s Cody Dirksen (10) took over at quarterback for the injured Trent Collins against Bethel on Friday night. The Bees shut out the Blackhawks 30-0. 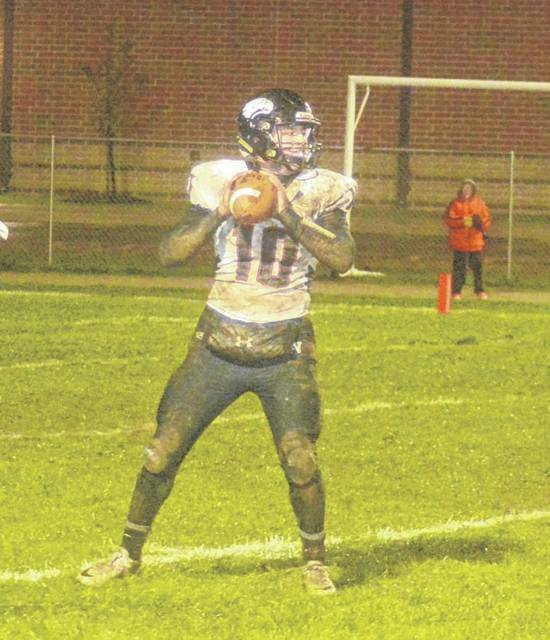 Mississinawa Valley’s Cody Dirksen (10) looks for some running room against Bethel on Friday night. The Bees shut out the Blackhawks 30-0. Mississinawa Valley’s Josh Fett (24) tries to get away from a Bethel defender on Friday night. The Bees shut out the Blackhawks 30-0. 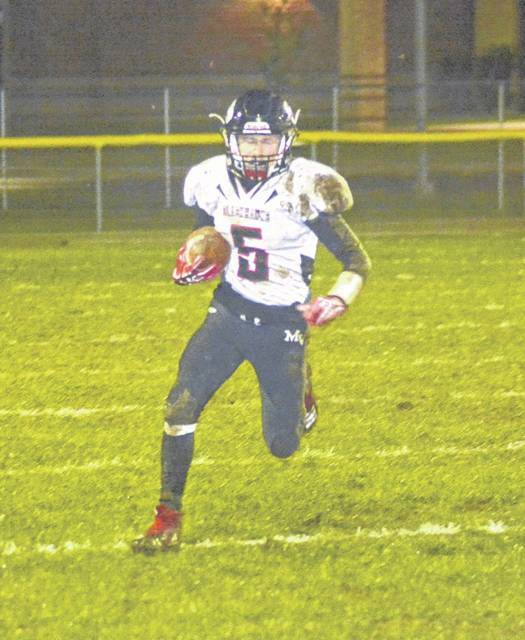 Mississinawa Valley’s Kyler Mote (5) runs the ball against Bethel on Friday night. The Bees shut out the Blackhawks 30-0. 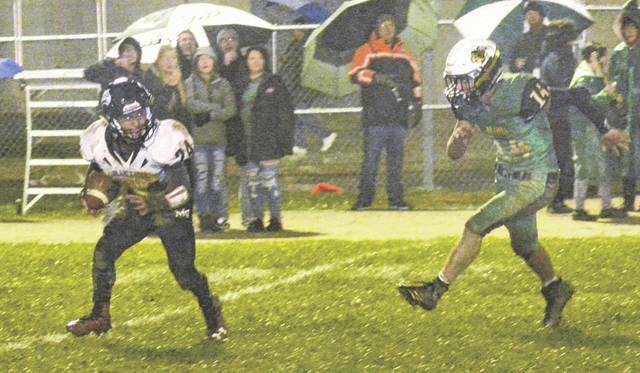 Mississinawa Valley’s Trent Collins (2) looks for an open receiver early in the game against Bethel on Friday night. Collins later left the game due to an injury and the Bees shut out the Blackhawks 30-0. TIPP CITY – The Blackhawks entered the game against the Bethel Bee’s with a 4-5 record. A win would have evened up their record. But injuries to key players left a thin roster decimated and the wet weather worked against an offense based upon perimeter speed and the pass. 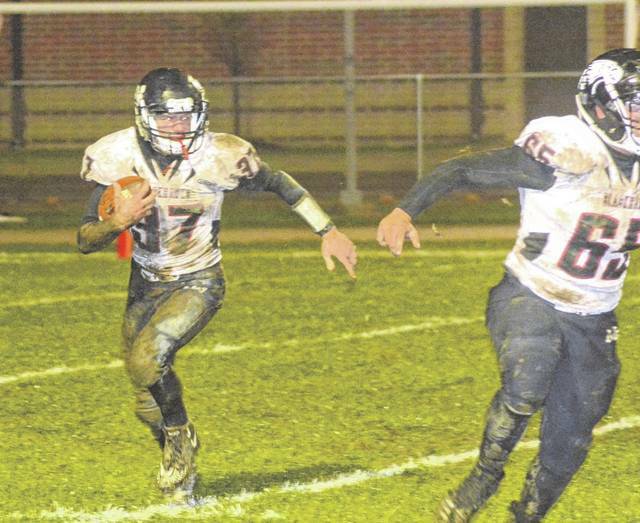 Although Mississinawa Valley threatened twice, they were held scoreless and fell 30-0. The cold rain affected both teams early on. There were three turnovers in the first two minutes of the game. Fans had to wonder if either team could run more than 2-3 plays before coughing up the ball. But Bethel uses a run-based attack using either a double wing or single wing set. They kept things simple and maybe passed a handful of times during the game. Once they adjusted to the conditions they fumbled no more. But the Blackhawks offense is spread out and uses the pass. Under these conditions often times a pass would be dropped, or if it was complete – it was caught by the wrong team. One of these was a pick six. It was hard to get the offense in gear as the team would be down a total of four starters by games end. Zeb Hannan and quarterback Trent Collins, two of the seniors on the squad, had to leave the game with injuries. The team did utilize a Wildcat offense with Will Hall and then Junior Cody Dirksen would come in to replace Collins at quarterback. Hall came close to a score in the opening drive of the second half. The team was only down 12-0 at halftime. Hall had a nice 38-yard run to the 7-yard line where he was eventually brought down. But the team couldn’t punch the ball in from there, failing to convert on a fourth and 5. That was a big momentum changer as Bethel drove 95 yards and scored again. The Blackhawks came close again in the last quarter when they got to 24-yard line, but could advance no further. They would eventually throw an interception that ended that drive. Still for a team that had to make a last minute coaching change before the season began, the Blackhawks managed to better their record for the second year in a row.